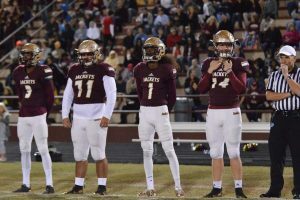 This past Friday (11/10), The St. Augustine High School Yellow Jackets football team hosted the Tate HS Aggie’s (Pensacola) in the first round of the FHSAA Region 1 – 6A playoffs. 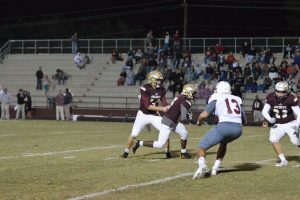 Playing as the first seed in Region 1, the Yellow Jackets defeated Tate by a score of 49-14, in a game that ended with a running clock through most of the second half. The Jackets held the Aggie’s to 163 yards of total offense while gaining 386 yards as a team. Taking advantage of a defense prepared for the pass, the Jackets turned to their running game and gained 283 yards, led by RB Dexter Brown (#15) who gained 217 yards on 13 carries, including touchdown runs of 68 and 65 yards. 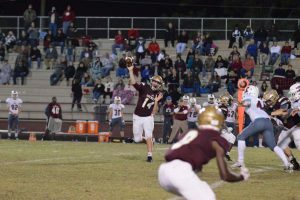 The St. Augustine passing attack, led by quarterback Austin Reed (#14), completed 7 passes on a modest 10 attempts (103 yards). The lone passing touchdown came on a 10 yard strike from Reed to Cedrin Daniel (#2) in the 3rd quarter. 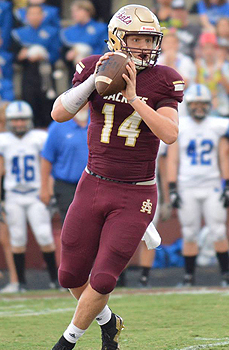 The game increased Austin’s season passing stats to 115-164 (70%), 2,218 yards, 29 TD’s/5 Int’s. Next up for the Yellow Jackets is a second round home playoff game against Navarre High School to be held on Friday (11/17) at 7:30 p.m. This entry was posted on November 17, 2017. It was filed under Game results. Austin Reed is a 6′ 2″, 210 lb. starting High School varsity quarterback who has been playing organized tackle football for 11 years in the St. Augustine, FL area. Over the years, he has played many positions on both offense and defense, but has emerged as a highly effective leader and successful quarterback on the field. 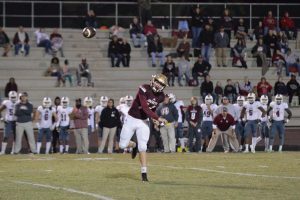 Before playing for the St. Augustine High School Jackets football team, Austin played 2 years for the Sebastian Middle School Eagles and 5 years for the Saint Augustine Saints Pop Warner Association. Austin is a 3 year Pop Warner Academic All American, a 2 time St. Johns County Middle School Athletic Association (SJMSAA) all county quarterback and an honors student at the High School.